My name is Claire Bush, and I am currently attending University of Wisconsin - La Crosse. I am studying to be a Physician Assistant, focusing on Biomedical Sciences; about two years ago, I decided this would be the perfect route for me. In May 2013, I will graduate with a major in Biomedical Sciences (Biology major and Chemistry minor) and minors in Spanish and Nutrition. This sounds like a lot of work, but my four-year plan looks doable right now, but we will see how that goes in a few semesters. When I am at home, I live with my mom and sister Ava in Hartland, WI. 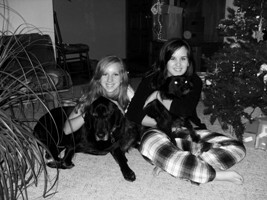 We have a black lab named Sam, a Humane Society dog named Jazmin, and a cat named Izzy. Yes, our house is full, but it is weird living on campus without everyone from home. Oh! I did buy a blue beta fish and named him Ralph to help fill the void while I am at school. We are avid gardeners, and I cannot wait to get home to start working in my butterfly garden again! Luckily I found other activities on campus, otherwise school work would consume me. This semester, I am secretary of my residence hall, and I absolutely love the Leadership Team this is a part of. In fact, I love it so much that I am running for Vice President of the same residence hall for next year. On top of my leadership duties within the hall, next year I am co-chair for La Crosse's Relay for Life, a member of NRHH, a member of Pre-PA club, an active volunteer, and an avid campus program attendee. UW-L is the best place in the world, especially with the bluffs surrounding campus and the river next to downtown; I highly recommend you stop by for a visit! Since the scenery is so darn gorgeous, it is easy to go for a run or a hike up the bluffs. Staying active is extremely important, and during the summer, I can see damselflies during my runs! Creating this website Organismal Biology with Dr. Sandland was definitely no small feat; researching, reading, writing, and revising for more hours than I would like to count took up most of my free time. Other students and I created these sites to contribute to MultipleOrganisms.net. I knew the damselfly was my first choice because they are dainty and unique because not too many people know what they are (hopefully you know now)! Creating this website brought back memories from hanging out at my cabin in the summer with the damselflies and dragonflies skimming over the lake. If you have not yet seen this in person, then you need to get to a lake as soon as possible because it is extremely relaxing. Hopefully you enjoyed your dance with damselflies! If you love the pictures on this site as much as I do, then click on them to go to the photographers' websites to see even more breath-taking photographs! The majority of these photographs are from Giff Beaton, Christopher Tranter, and Glenn Corbiere. Please contact me at bush.clai@students.uwlax.edu. You can also contact Dr. Sandland at sandland.greg@uwlax.edu.